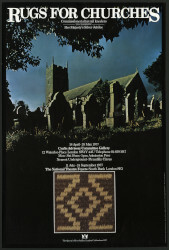 Black and white photograph of Peter Collingwood with overlaid transparency showing formatting notes for the Crafts Advisory Committee's exhibition publication 'Rugs for Churches'. 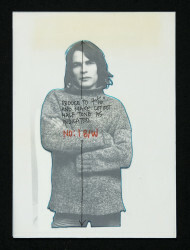 Collingwood stands with his hands by his hips wearing a dark jersey and glasses hung around his neck. Photograph by Richard Davies, 1977. 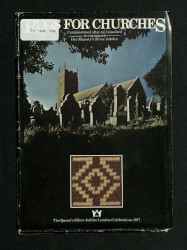 Photograh of Peter Collingwood, Richard Davies, 1977, © Crafts Council. 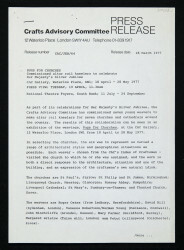 Crafts Council Collection: AM169.